The Valley Cats Party (Cover) Band are Central California's Premier Pop Hits Variety Cover Band! They love to perform FUN LIVE Dance Music throughout California and Nevada at Your Corporate Party or Company Party or Private Party or Wedding or for ANY kind of Special Event just like the video shows! The Valley Cats Band are Bride & Groom favorites for Weddings! Company and Corporate Parties & Special Events of all kinds also book The Valley Cats! 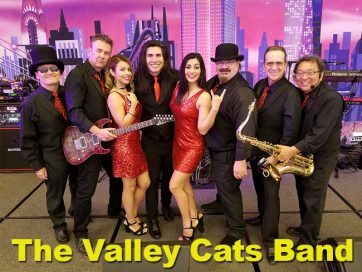 The Valley Cats Band performs current Hit Pop Music, Top-40, Rock, Disco, Country, Classic Rock, Standards and all the Party Favorites that everyone knows and sings along to! Indulge your Wedding Guests & Party Guests with Central California's Premier Dance Pop Party Cover Band! So come Enjoy the Sights and Sounds of Real Live Music at your next upcoming Special Event by featuring The Valley Cats Band! Now you can treat your Party Guests to an evening of Dynamic Hit Dance Music that everyone will be gushing about forever!